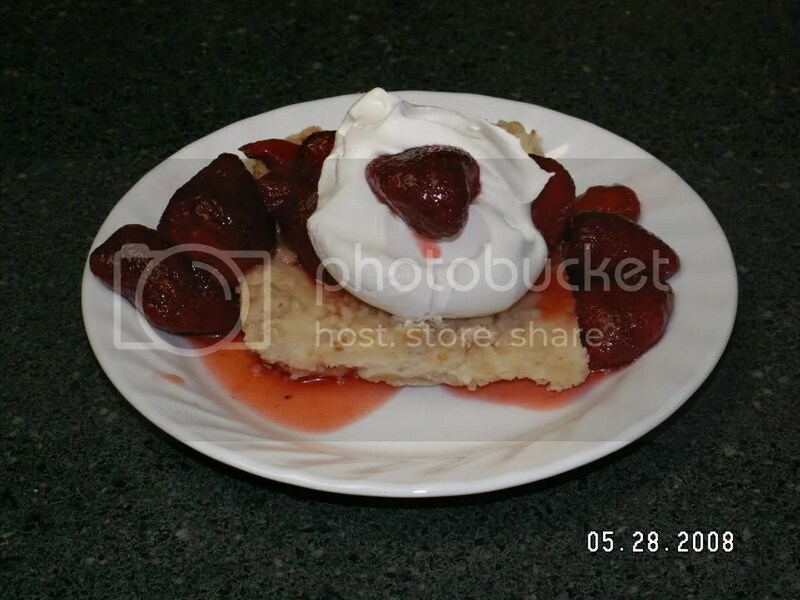 I found this recipe from homestead blogger mommaofmany in March 2008. Since the upgrade, I have not been able to access her site. I absolutely LOVE these Cheesecake cookies and did not originally post the recipe, only a link to her post for the recipe. I topped mine with strawberries I had cut up and soaked in sugar in the fridge for a few hours, then added whipped topping. YUM! Preheat oven to 350. Mix butter, brown sugar and flour until crumbly. set aside 1 cup of crumbs. Lightly grease a 9 x 13. Press remaining crumbs into bottom. Bake for 15 minutes. In another bowl, combine sugar and cream cheese until smooth. Beat in egg, milk, lemon juice and vanilla. Spread over crust and sprinkle with topping. Bake 25 minutes. Cut into squares. You can also spread your favorite preserves over bottom crust before adding the cheesecake mixture. Bake as directed. NOTE FROM TERESA: My oven required 30 min bake time when I baked this recipe, so just use best judgement. AND MOMMAOFMANY, I HOPE YOU START BLOGGING AGAIN SOON. I MISS YOUR RECIPES!!!! Every time I visited my Aunt Juanita’s house growing up, she inevitably fed me wonderful dishes, both desserts and main meals. She also taught me how to cook many of these wonderful dishes. One of my favorite recipes that my Aunt Juanita taught me to make is hot fudge sauce. She used to make hot fudge cake for me if she knew I was coming. She always made sure to stock her kitchen with the necessary ingredients and I would practice my culinary skills with my aunt by my side many, many times through the years. We’ve had so many wonderful memories in her kitchen. I have used Aunt Juanita’s hot fudge sauce recipe on brownies and pancakes, too, not just cake. It is super-easy to make and DELICIOUS! Use a prepared cake mix such as Devil’s Food Cake Mix from the store and cook it according to directions on the box, or make one from scratch, either way will be fine. As for brownies, again…just your choice…homemade or store bought mix. The key to this divine creation is THE SAUCE! In heavy saucepan on low-med heat, combine first three ingredients and stir with wooden spoon until well blended. Continue stirring occasionally to keep from sticking. Also turn down heat to low if your oven tends to burn easily. Cook until sauce starts to thicken and boils ever so slightly (will be really large bubbles). Remove from heat and stir in vanilla extract. 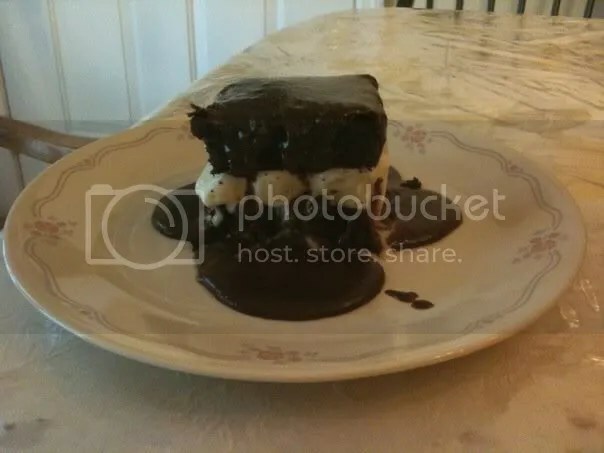 Sandwich ice cream between a piece of cake cut in half widthwise, then pour fudge sauce over entire dessert. Top with a marischino cherry for a lovely presentation. Sandwich ice cream between two brownies, then pour fudge sauce over entire dessert. Top with marischino cherry for a lovely presentation. This is one of my most favorite homemade cakes. 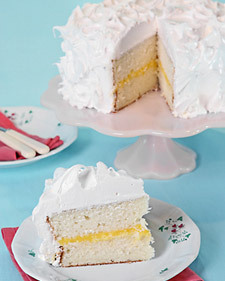 I found it on Martha Stewart’s website after watching her tv show one day and drooling :O). I added the link to her site on the picture above if you want to see the official recipe. NOTE: The only thing I have changed when I make the cake is I sometimes add coconut to the outside by taking about 1/4 cup milk, adding lemon extract (or lemon juice) and a few drops of yellow food coloring, then I soak a bag full of coconut (or use freshly grated…yum!) in the mixture for a few minutes and mix it up until well-coated. This turns the coconut yellow. It is also a good way to freshen coconut if it is a little dry. I then put the coconut all over the finished iced cake as the very last step. 1.Preheat oven to 350 degrees. Butter two 9-by-2-inch round cake pans; line bottoms with parchment paper rounds. Butter parchment, and dust with flour, tapping out excess; set aside. 2.Into a medium bowl, sift together flour, baking powder, and salt; set aside. In the bowl of an electric mixer fitted with the paddle attachment, beat butter and 2 cups sugar until light and fluffy, 3 to 4 minutes, scraping down sides of bowl as needed. Beat in vanilla. With mixer on low speed, add flour mixture in three parts, alternating with milk and beginning and ending with flour; beat until just combined. Transfer mixture to a large bowl; set aside. 3.In the clean bowl of an electric mixer fitted with the whisk attachment, beat egg whites on low speed until foamy. With mixer running, gradually add remaining 1/4 cup sugar; beat on high speed until stiff, glossy peaks form, about 4 minutes. Do not overbeat. Gently fold a third of the egg-white mixture into the butter-flour mixture until combined. Gently fold in remaining whites. 4.Divide batter evenly between prepared pans, smoothing with an offset spatula. Bake, rotating pans halfway through, until cakes are golden brown and a cake tester inserted in centers comes out clean, 30 to 35 minutes. Transfer pans to a wire rack to cool 20 minutes. Invert cakes onto rack; peel off parchment. Reinvert cakes, and let them cool completely, top sides up. 5.Using a serrated knife, trim tops of cake layers to make level. Place one layer on a serving plate, cut side up. Using a pastry bag fitted with a coupler, pipe frosting around the perimeter. This dam will prevent the lemon curd filling from seeping out. Fill cake with lemon curd. Place other cake layer on top, cut side down. Spread entire cake with frosting, swirling to cover. 1.In the heatproof bowl of an electric mixer set over a saucepan of simmering water, combine sugar, corn syrup, 1/4 cup water, and egg whites. Cook over medium heat, stirring frequently, until mixture registers 160 degrees on an instant-read thermometer, about 2 minutes. 2.Attach bowl to a mixer fitted with the whisk attachment. Beat mixture on high speed until glossy and voluminous, about 5 minutes. Beat in vanilla. Use immediately. Prepare an ice bath fitted with a medium bowl; set aside. Whisk together yolks, zest, juice, and sugar in a small saucepan. Set over medium heat, and stir constantly with a wooden spoon. Cook until mixture is thick enough to coat the back of the wooden spoon, 5 to 7 minutes. Remove pan from heat. Add butter, 1 piece at a time, stirring until incorporated. Pass through a fine mesh sieve into prepared medium bowl. Stirring frequently, let stand until cool. Place a sheet of plastic wrap directly on surface of curd to prevent skin from forming; wrap tightly. Refrigerate until firm and chilled, at least 1 hour. Store refrigerated in an airtight container for up to 2 days.